Looking for a ‘wicket’ good time? 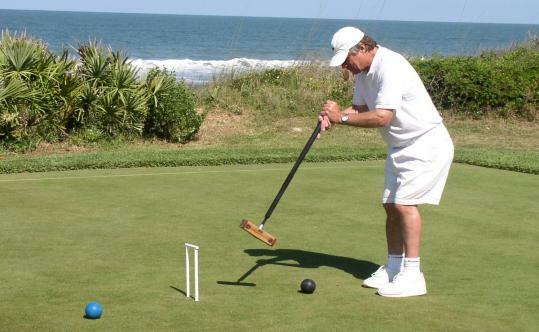 Croquet expert Bob Kroeger will instruct players in the finer points of the game. The very English pastime of croquet, which had everyone there whacking balls through “hoops’’ in the 1800s, will take center stage at a fund-raising party at Duxbury’s King Caesar House, a New England mansion dating from the early 19th century. The Duxbury Rural and Historical Society will host the “Wicked Wicket Party,’’ a croquet tournament with refreshments for both players and spectators on the grounds of the King Caesar House museum. The Federal mansion was built for Ezra Weston II, known as “King Caesar’’ for his international prominence as a shipbuilder and merchant. The hosts will set up the “pitch’’ - or playing field - on the front lawn of the house and in a grassy park across the street. The tournament will be played according to the rules of “Golf Croquet,’’ a variation of the traditional game that calls for 12 metal hoops - or wickets as they tend to be called on this side of the Atlantic. “We were going for something evocative of bygone days,’’ said Patrick Browne, the society’s director. The fund-raiser will help the society meet its goals of maintaining two museums, providing education programs, preserving artifacts, maintaining archives, and encouraging public interest in the town’s history. To assure that tournament participants get into the swing of things, the society has called on one of America’s best known croquet players, Bob Kroeger, a former member of the US National Croquet Team and a member of the Croquet Hall of Fame. Currently the director of the US Croquet Association Instructional Schools, Kroeger will give a primer on the rules of Golf Croquet to players before the first mallet is swung. “His credentials are amazing. He’s the go-to guy,’’ Browne said of Kroeger. Kroeger, who lives in Dennis and describes himself as “a full-time traveling croquet professional’’ concentrating on promoting all forms of the sport, is the author of the “Official USCA Shot-making Manual’’ along with a set of croquet strategy books, written with fellow hall of famer Teddy Prentis. The rules for Golf Croquet make for a game that “can be picked up rapidly by beginners,’’ Kroeger said. Teams compete to strike the first ball through each wicket. Once the first player’s ball is through, his team gets one point, and everyone turns their shot-making skills to the next wicket in sequence. If the teams are tied after 12 wickets, wicket number 3 serves as the tie-breaker. To accommodate a larger number of players, the tournament will have four-member teams (instead of the usual two), which will play round-robin matches, followed by an elimination round to determine the winner of the coveted Weston Cup - named after King Caesar himself. After team play, the eight highest-scoring players will compete in a round of individual play to determine the tournament’s best individual player. In tune with the affair’s British tone, caterers will offer some English-style refreshments, including a cocktail called Pimm’s Cup. While conventional wisdom holds that food makes the party, “with ours it’s the drinks,’’ quips Alison Arnold, the society’s assistant director. The concoction is “very British,’’ Arnold said. Founded on a gin-based liqueur, mixed with lemonade and cucumber, borage, and summer fruits, the drink is popular in southern England. The food menu is “heavy hors d’oeuvres’’ consisting of “passed food’’ - watermelon cups with crab, mini Caesar salad cups, wild mushroom profiteroles, chilled gazpacho shooters, tea sandwiches, and an antipasto tray. To register a team of four, contact the historical society’s main office at 781-934-6106 or e-mail Arnold as aarnold@duxburyhistory.org. Robert Knox can be reached at rc.knox2@gmail.com.